Since the early '80s, Jim Gordon Thirlwell has operated under a variety of permutations of the name Foetus (including Scraping Foetus off the Wheel, Foetus Interruptus and most recently, just Foetus). Thirlwell has expressed his intention to "condense the entire history of recorded music into one piece," and elements of serialism, funk, minimalism, '50s exotica and jazz often add colorful inflection to his creative foundation of post-punk experimentalism. Manorexia was initially conceived as a solo project, emphasizing a type of cinematic minimalism that favors space and subtlety, allowing the more fleeting sonic objects to resonate fully. 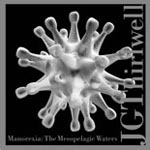 The Mesopelagic Waters features music from the first two Manorexia albums, arranged for string quartet, percussion and piano, with Thirlwell adding samples and other textural elements. "Armadillo Stance" opens, the strings engaged in pensive counterpoint, marked by pizzicato and sul ponticello interruptions, as the piano and percussion maintain a glacial pacing. "Toxodon Mourning" churns with a tone of impending disaster, and then shifts to haunting piano chords, followed by an almost tender chorus of Morricone-esque wordless vocals. Though the record often focuses on the gradual transformation of repetitive material, "Chloe In the Morning" is a vast expanse of emptiness created by clouds of overlapping sustained pitches and the unsettling "Tubercular Bells," with an abrasive clatter of crashes and scrapes. "Zithromax Jitters" eschews the emphasis on space, filling every available moment with skittering rhythms that eventually all fall into intense unison, only to break apart into near-chaos once more at the end. The extended ending sequence of the closing track, "Tranque," mixes poignant upper register piano arpeggios, shimmering glockenspiel and an ominous, repetitive melodic fragment on the violin, as everything gradually fades to silence. Thirlwell's innovative arrangements exquisitely translate the mood of the electronics-laden originals to acoustic instrumentation, as the piano voicings, tuned percussion and various bells and other small objects create a deeply evocative texture. Thirlwell is a master at shifting between eclectic reference points to create a variety of moods, at times unsettling or charmingly accommodating. Manorexia distills these tendencies into a markedly introspective collection. Track Listing: Armadillo Stance; Canaries in the Mineshaft; Toxodon Mourning; Zithromax Jitters; Chloe Don't Know I'm Alive; Fluorescent Radiation; Tubercular Bells; Tranque. Personnel: David Broome: piano; David Cossin: percussion, ccarina; Felix Fan: cello; Leyna Marika Papach: violin, vocals; Elena Moon Park: violin, vocals; JG Thirlwell: samples/keys, tin whistle, vocals, additional piano strings; Karen Waltuch: viola, vocals.